Who were the Pioneers and why is there so much nostalgia for them? Participants of the parade on Red Square in Moscow on the 50th Anniversary of Soviet Power and 45th Anniversary of the All-Union V.I. Lenin Pioneer Organization. Moscow, 1967. May 19 marks the 95th anniversary of the founding of the Pioneer movement in Soviet Russia. The Pioneers — alongside Lenin, Gagarin’s smile, and the Hammer and Sickle — were one of the most recognizable symbols of the USSR. Most Russians over the age of 35 have fond childhood memories of their Pioneering days. "Always forward, not a step back"
Scout organizations existed back in pre revolutionary Russia in the early 20th century. The idea was imported from the United States. In 1917, about 50,000 children and adolescents were members of scouting associations. However, after the October Revolution, they were viewed by the new Soviet authorities as "hostile remnants of Tsarist Russia," and were quickly disbanded. The Scout movement did an excellent job of uniting and educating children. 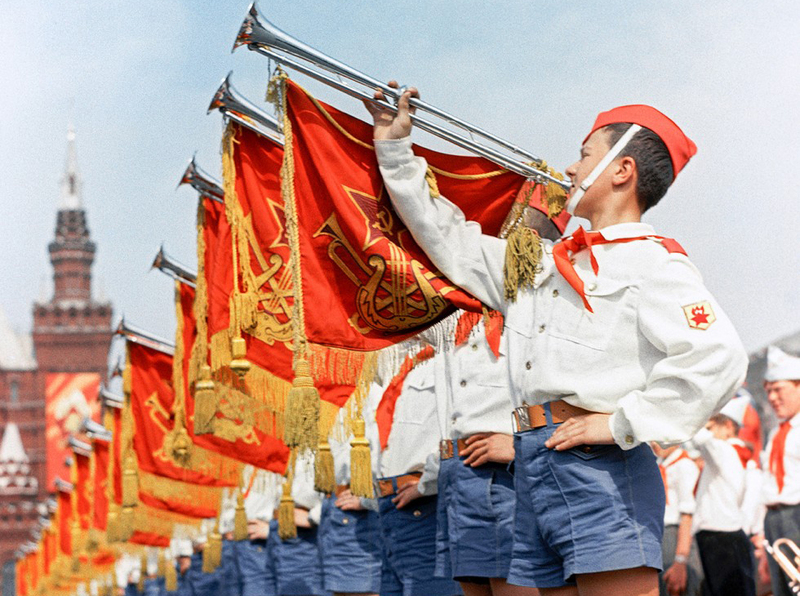 The young Soviet government understood this, and so decided to create its own youth organization that would be "scout-like in form and communist in content," according to one of the founders, N.K. Krupskaya. So on May 19, 1922, the decision was taken to create Pioneer divisions throughout the country. The purpose of these Pioneer divisions was to educate Soviet children to be loyal to the ideals of communism and the party, as expressed in the motto: "Pioneer, be ready to fight for the cause of the Communist Party!" The first generation of Soviet youth had quite a political upbringing. For instance, a key role model for schoolchildren in those days was Pavlik Morozov, a perhaps legendary, zero-tolerance fighter against the "enemies of the people," who is said to have testified against his own father for suspected tax evasion. However, the political side of the Soviet upbringing gradually diminished over time. "A Pioneer is an example to all"
Pioneers in the USSR were adolescents aged 9-14. Joining the Pioneers was an important milestone in the life of every Soviet schoolchild — a truly unforgettable event. Usually the formal ceremony was held on either of two key dates in the Soviet calendar: April 22 (the birthday of Lenin, whose name the organization bore) or May 19 (Pioneer’s Day). Many adult Russians still remember that spine-tingling day, when a red tie was placed around their neck, whereupon they were no longer "October Children" (as younger schoolchildren were called), but members of the far more prestigious Pioneers. For schoolchildren, having Pioneer status was a matter of immense pride, encapsulated in the expression: "A Pioneer is an example to all." Ideally, he or she should be honest, disciplined, courageous and always respectful of elders and juniors — put simply, the embodiment of all the finest human qualities. A core element of summer Pioneer camps was sport. Especially popular were the games "pioneerball" (based on volleyball) and zarnitsa (a war game). In addition to games and sports, the focus was on socially useful activities: Children took part in subbotniks (community work days, usually on Saturday), collected waste paper and scrap metal, assisted elderly people, helped fellow schoolmates falling behind in class, and formed part of volunteer fire brigades. It was a particular honor for Pioneers to participate in all the dazzling parades marking seminal dates in Soviet history. "Pioneer tie! / It has no kith or kin. / All the young blood / Has made it redder still"
The Pioneers would not have been so recognizable had it not been for their memorable symbols, largely borrowed from the Scout movement. For example, the ubiquitous tie. For Scouts, it had a practical application: This piece of cloth could be used to bandage a wound or remove a boiling pot of food from a campfire, for instance. Its color also differed depending on various factors. The Pioneer tie, however, was always bright red and served as the sacred symbol of the whole movement. Red in Soviet symbolism represents the blood spilt for the sake of the revolution. The triangular shape of the tie was interpreted as follows. Each corner denoted one of three generations: Communists, Komsomol members, and Pioneers. However, Soviet schoolchildren found another use for their ties: When a Pioneer camp came to a close, they would write down each other’s names and addresses on them so as to exchange letters and keep in touch when they returned home. When a Pioneer camp came to a close, they would write down each other’s names and addresses on their ties so as to exchange letters and keep in touch when they returned home.